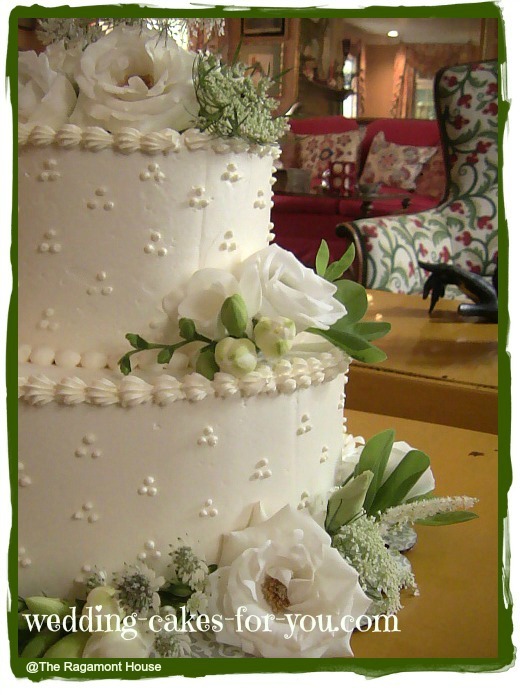 Small wedding cakes are so dainty and quite elegant like the ones pictured below, a two tiered dotted Swiss design with fresh flowers and a Victorian style with buttercream roses. 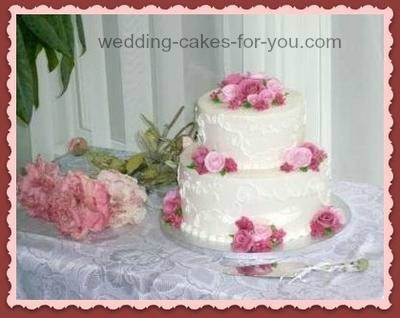 TIP: These smaller sizes are perfect if you are considering making your own or for a first time experience building and decorating a wedding cake as well as a second marriage or Anniversary. The cake flavor for the dotted Swiss design below was the chocolate buttermilk cake recipe on this website filled with white chocolate buttercream and raspberries. The very feminine lace adorned one to the right was an almond torte with crushed almonds and currant jelly filling surrounded by almond buttercream. 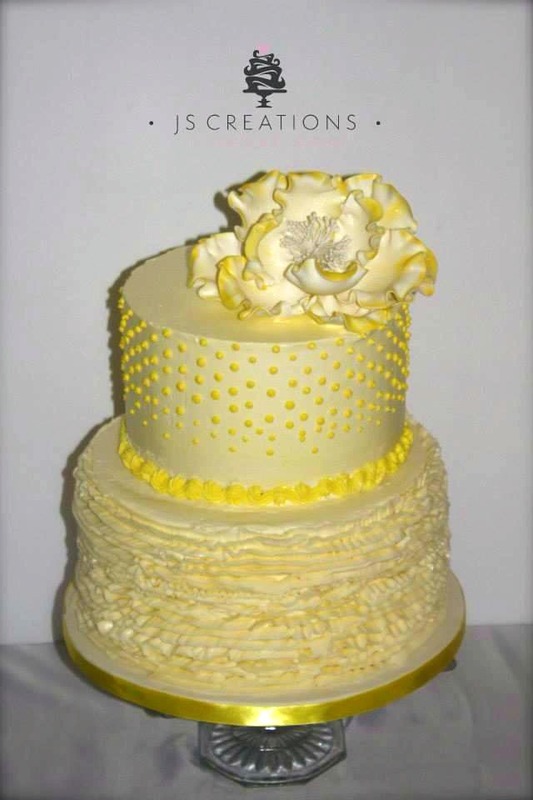 The sweet ruffles and dotted yellow creation below is by JS Creations who shares her lovely cakes with us on facebook. I love her style. 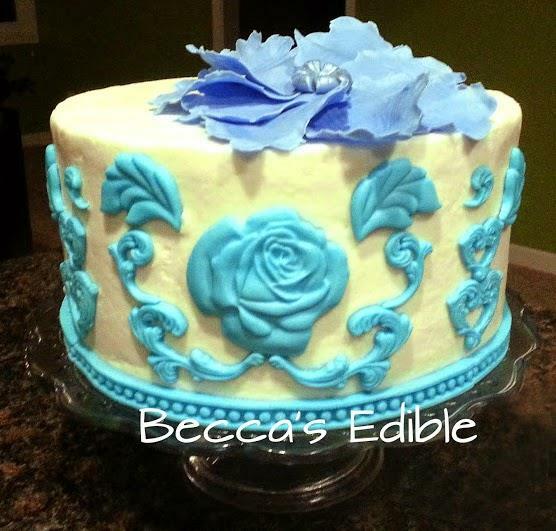 The gumpaste flower really makes this a stand out. 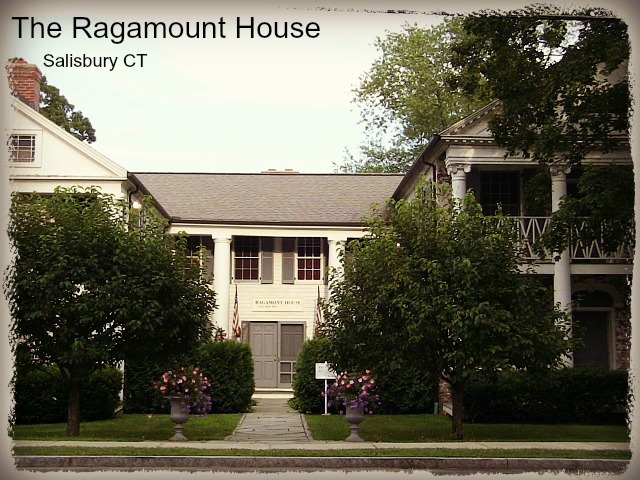 The Ragamont House is located in the quaint little town of Salisbury CT. and is where some of my little tiered confections are delivered to. Its a wonderful place to have a celebration of any kind. This photo was shared by Thurley Burns. It's small but very beautiful! 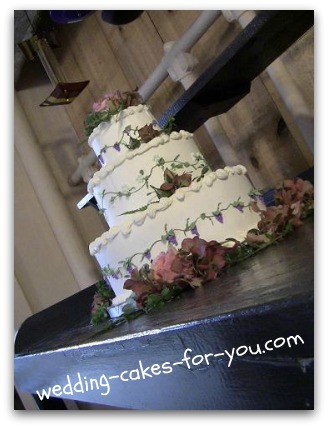 The ornate royal icing strings on the sides and draping strings from the top raised tier are pretty amazing. Work like this is not seen so much anymore. It was created by The Greenbriar Country Club. This was for a wine themed wedding. It serves 125 people although I made it larger than it needed to be. 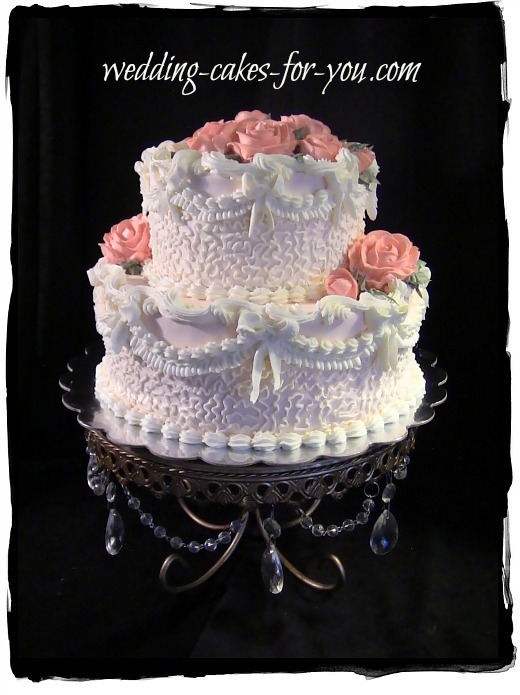 It has a 12 inch bottom tier, an 8 inch middle tier and a 4 inch top. The flowers were provided by Hansen's Flower Shop in Fairfield CT. 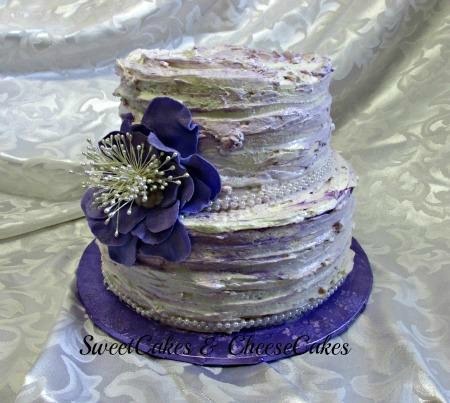 The tiny grapes, flowers and leave designs were piped onto the sides of the cake using buttercream in a pastry bag. The White Silo Winery in Sherman CT is a fabulous spot to have a small wedding and is where this celebration was held. You can find them on Facebook. 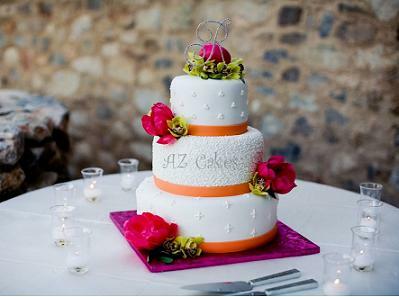 This sweet little confection to the right is made using fondant with royal icing piping, fabric ribbons, fresh flowers and a monogram topper. It is small but the colors really make it outstanding. 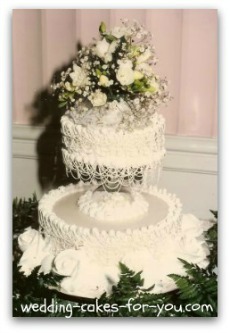 The middle tier is decorated with cornelli lace, The bottom and top are embellished with dots. 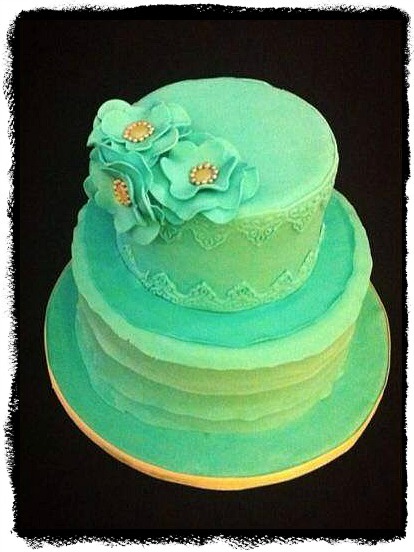 I am loving the vibrant Aqua Blue small wedding cake by Madiha Imran. 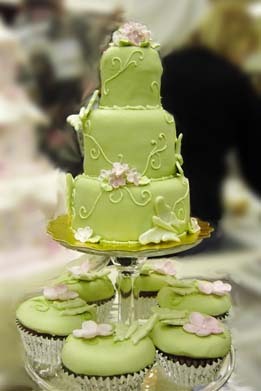 It was not designed as a wedding cake but certainley could be used as one. This tiny creation surrounded by mini's is so adorable. Big is not always better in this case. 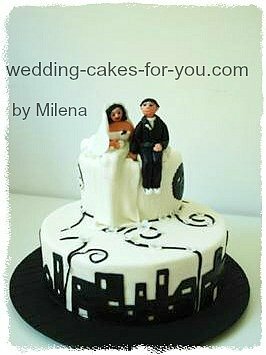 Mini wedding cakes and cupcake wedding cakes are becoming quite trendy. 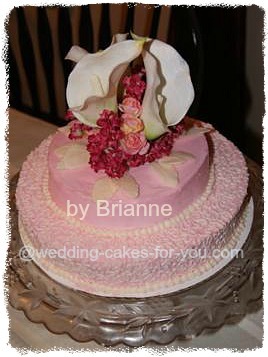 The flowers and butterflies are most likely made of gumpaste and it appears to have buttercream scrolls piped onto the sides. This was entered into the very first decorating contest at this website. 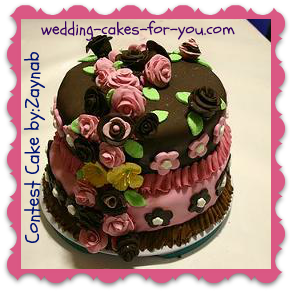 Read and comment on Zaynab's submission and story here.